If using wooden skewers, soak for 30 minutes in water. Place the shrimp in a medium mixing bowl; then in a small mixing bowl, whisk together the Old Bay Seasoning, olive oil, and garlic powder. 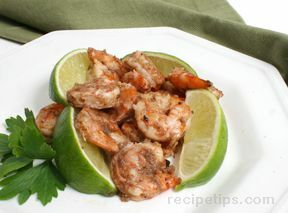 Pour over the shrimp and marinate in the refrigerator for 20-30 minutes. 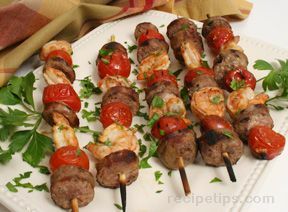 Alternate the shrimp and tomatoes onto the skewers. 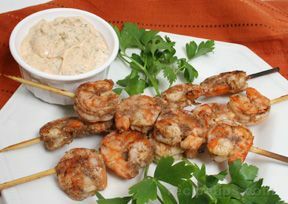 Place directly onto a grill heated to medium heat and cook for approximately 5 minutes on each side until the shrimp is pink and nicely grilled. 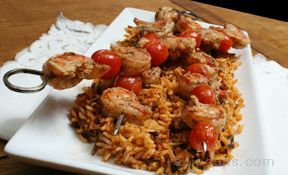 Serve warm with tomato rice. Saute the rice in oil in a saucepan over medium-high heat for 2-3 minutes. Stir in the tomato paste and sautÃ© for 2 minutes more. Add the chicken stock or bouillon and bring to a boil. Reduce the heat, cover, and cook for 20-30 minutes, or until the liquid is absorbed.